Simple and packed with flavor, onions and bacon are the perfect complement to farmstand-fresh green beans. Cook bacon until crisp in skillet, drain bacon, and set aside, reserving bacon grease. In skillet with bacon grease, saute onions with sugar, salt, pepper, and apple cider vinegar until tender. Set aside. 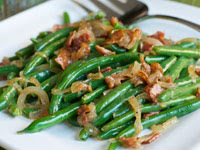 Steam or blanch green beans until tender, and toss with onion mixture and reserved bacon pieces. Serve warm or at room temperature. This entry was posted on 8:20 PM and is filed under Vegetables . You can follow any responses to this entry through the RSS 2.0 feed. You can leave a response, or trackback from your own site.